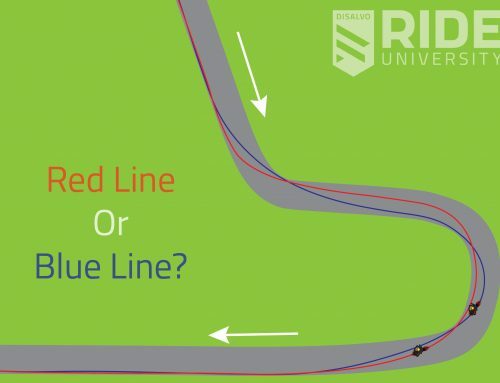 Time to break down the Red/Blue challenge and see what our two riders are doing, and how they could be doing it better or differently based on their situation! The first thing I want to point out, is that we’re missing some variables for this question. 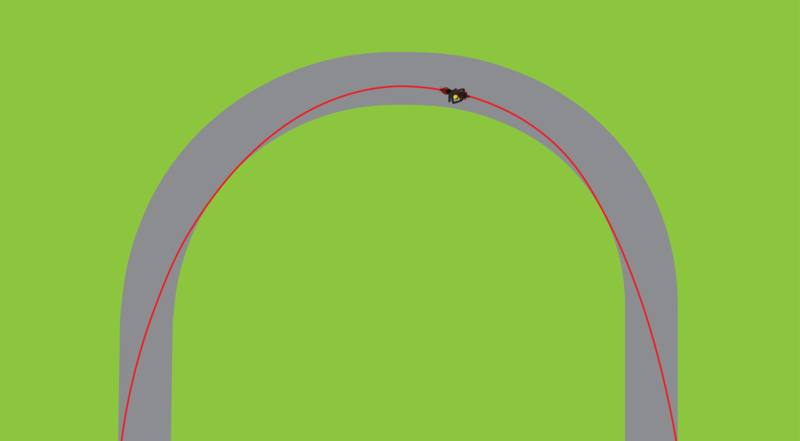 Let’s assume the following: both riders are on the same bike (bike type may be different though from situation to situation, but both riders are always on the same bikes) and the straightaways entering and exiting this corner go on forever (ok, they’re just really long). 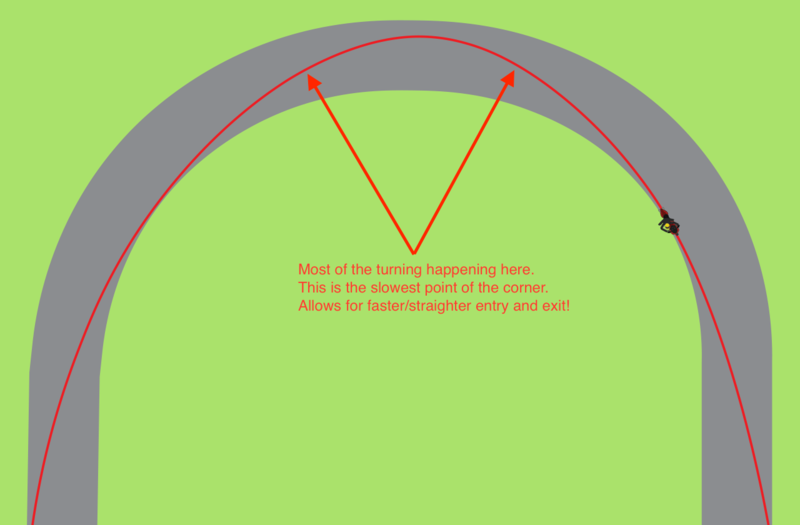 ** Also I want to preface this post – when we talk about TURNING, we really mean ROTATING THE MOTORCYCLE or you can also think of it as having more or less RADIUS in a given section of the turn. We cover this concept in depth in our first first course on Body Position in the online courses. ^^^^^ These were all awesome comments!! Very true on all counts. More than likely they’ll be on the throttle as soon as they tip in, but it will be a very static ~1% throttle that will just be maintaining their line around the rest of the corner until the exit lines up. This isn’t really the end of the world… this can happen to any of us on the track. With good discipline you can get through it by waiting. The PROBLEM here is that we get antsy as riders. We want to open the throttle EARLY before we’re pointed down the track (like the red rider is). 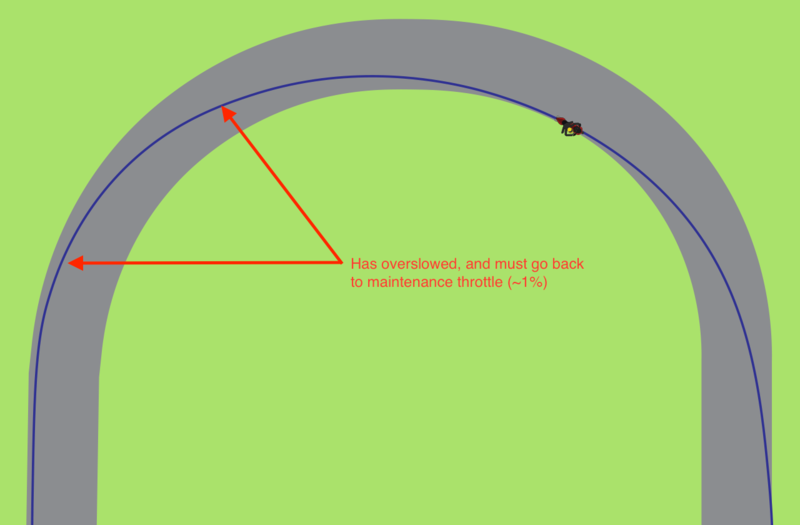 This is going to lead to all kinds of problems as we start to reach the edge of traction – being ON the throttle when we have a LARGE amount of lean angle is a recipe for disaster (unless of course you’re on a small displacement motorcycle – we’ll discuss that here shortly). 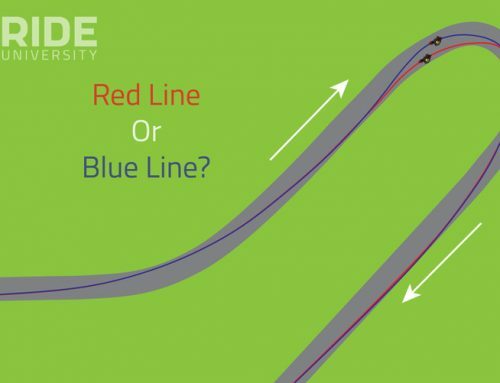 So how can we help Blue Line Rider here? What would bring their line back into something that has better principals applied at tip-in and allow them to not over-slow?? 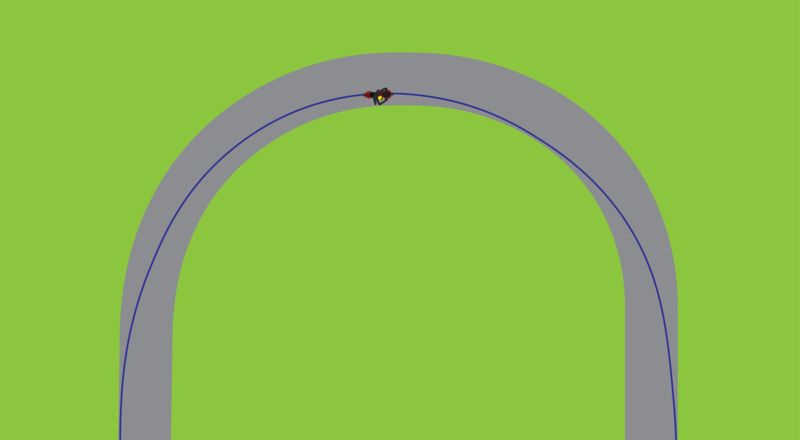 Here is a modified version that would work for LOW-DISPLACEMENT motorcycles or would be a more conservative line that I would personally think about in a racing situation where you’re opening yourself up to be overtaken mid-corner. I know not all of us are going racing, but this is always the kind of stuff I’m taking about when picking lines personally. This is going to be a better choice for lower displacement motorcycles – any of your new 250cc or 300cc sportbikes (which are a blast if you’ve not tried them yet around a race track), your GP125 motorcycles or perhaps even an SV650 twin should all consider this for a line choice. The number one thing that Red Line Rider has going on here is he’s making STRAIGHT LINES both entering and exiting. 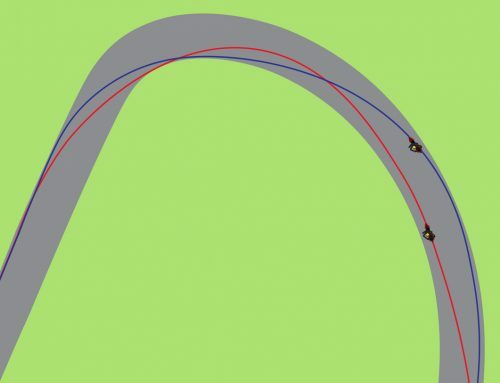 What we know about this and what you can learn in the “Making Straight Lines” lesson in the online courses is – when you have less RADIUS to your turn you can have less LEAN ANGLE. This is going to allow you to start creating opportunities to trail brake (again, we’ve got GREAT information on this in the online courses). This approach ALSO gives you the straightest exit. 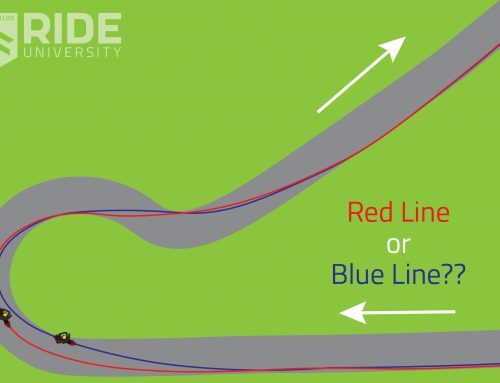 I did see a lot of people talking about the blue line having a longer exit… but remember you can’t start accelerating until you’re in a position to take away lean angle. That’s where Red Line REALLY excels (no pun intended). 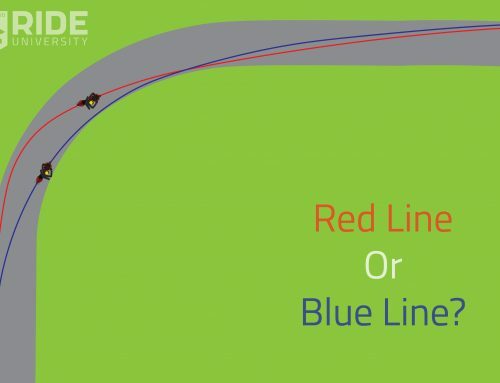 Red Line’s only issue through this corner is… if he or she were in a racing situation they would be opening themselves up to be passed mid-turn. Understanding again, not all of us are going racing, you might not be thinking about this. For those of us that are though, I’ve got a modified version that you might call the “last lap scenario” that is an alternative. This can also be used as a bridge to get you from Blue Line to Ride Line – it’s not always easy to just hop out on the race track and make a big change like this in a few laps. It may also be a decent option for our low-displacement motorcycles. The important thing for me is…. how can we fix our late turn in and over-slowing? Understanding how to trail brake properly and effectively is the key! Our online courses (have I mentioned those yet?) can help you learn this skill, but you DO need to complete all of our other core courses to access it. There’s a lot of ground-level material that has to be laid before we jump into that topic. 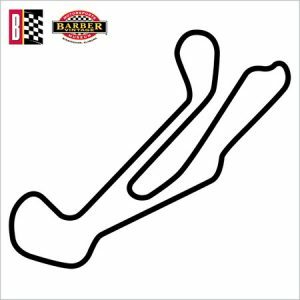 Lastly – If you want to skip all of the online stuff and just learn this technique with us on the race track… go sign up for one of our events and come ride with us at the track!! We cover ALL of this material in one weekend of awesome riding!